The 2018 Dodge Challenger is one of the most popular muscle cars on the market. This car is designed to recall the classic Challengers of years gone by. There are vintage-style striped versions. An abundance of options is available. For example, the Challenger is available in ten standard colors. There's something for every personality. The Challenger has also adapted to the best and most modern technology. LED headlamps light up the night like never before. LED tail lamps extend for the full width of the Challenger. This not only aids in safety, it also looks great. 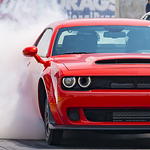 The SRT Hellcat model features twin air extractors and classic style round headlamps. The best way to see the 2018 Dodge Challenger is up close and personal. The details and options, from racing stripes to power bulges, are breath-taking. Stop by Feeny Chrysler Jeep Dodge the next time you're in Gaylord, MI. We'd love to put you behind the wheel.